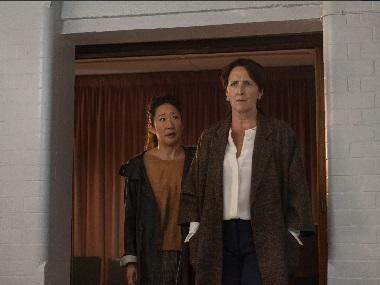 BBC America has released first look images of its upcoming season of Killing Eve. The series feature Sandra Oh as Eve Polastri, an MI-5 agent tasked with capturing the talented assassin Villanelle, played by Jodie Comer. None of the stills feature the two of them together, but they do give a glimpse into the new dangers they will have to face. Comer's character is battered and bleeding profusely in one image, which takes place after Eve stabs her in the finale of the first season. Another still shows a despondent Eve in a tub. The show, based on the Codename Villanelle novellas by Luke Jennings, has been co-written and executive produced by Phoebe Waller-Bridge, the creator of Fleabag and also stars Fiona Shaw as Carolyn Martens, writes Deadline. Oh had received an Emmy nomination for Lead Actress in a Drama Series and the show also earned a drama series writing nomination for Waller-Bridge. It was also named Best New Show by the Television Critics Association. Killing Eve will have Damon Thomas returning to direct along with Lisa Brühlmann and Francesca Gregorini.